Another event that happens as part of Christmas in Cambridge is the CP Holiday Train which is a fundraiser for the Cambridge Self-Help Food Bank. 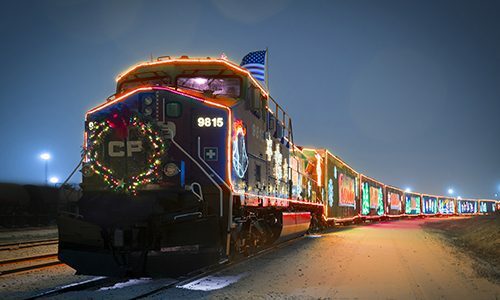 Two trains decorated in lights travel from the East to the West Coast of Canada, collecting food donations along the way. Since it was started in 1999, the CP Holiday Train has raised over $14.5 million and 4.3 million pounds of food. Locally, all food and monies raised are donated to the Cambridge Self Help Food Bank. The train makes an annual stop at the Malcolm Street Station in Cambridge, delighting crowds with its colourful train cars and live music performances. In the past, the train has featured performances by Tom Cochrane, Sheryl Crow and Great Big Sea. DYK: Cambridge holds the largest Phil Kline’s UnSilent Night in the world! The Cambridge Christmas Market runs for four days the second week of December each year at Cambridge City Hall. Quality vendors and artisans fill City Hall and Market Square to create a one-stop shopping destination for unique gifts, seasonal food and a great shopping atmosphere. Each day the market features entertainment and a different activity which will have shoppers visit more than once. The New Year’s Eve Party takes place at the Hespeler Arena, and completes the festival. It includes free skating, a bouncy castle, crafts, games, a photo booth, live entertainment and more. Market Road Antiques is a treasure house of over 100 dealers in a bright, pleasant space of 20,000 square feet! Find furniture, glassware, estate jewelry, vintage items and more. Open every day, including holidays.